When my oldest was born, we set up a crib right next to my side of the bed. I loved the idea of snuggling up together at night, but I wasn’t sure whether it was safe. I started poring over the research. 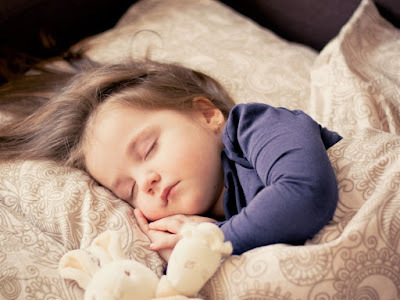 One of the best resources I ran across was research by Dr. James McKenna, Director of the Mother-Baby Sleep Laboratory at Notre Dame University. I learned that for babies, sleeping within sensory range of their caregivers, meaning that they can experience their sounds, smell, and occasional touches is protective against SIDS. I learned that, as long as some important safety precautions are followed (baby next to breastfeeding mother only, non-smoking family, firm mattress, etc. ), bedsharing is just as safe as crib sleeping and safer than solo sleep for babies. When my oldest was 6 months old, we made the transition to full time bedsharing. 2. It goes hand in hand with breasfeeding. 3. It’s not just for babies. When we made the transition to full time bedsharing, it was to make nighttime nursing easier so I could get more sleep. We thought that our daughter would soon move to her own bed and room, certainly by age two. Now she’s four and still bedsharing and we love it. Toddlers and preschoolers need a lot of closeness too. 4. It’s a great way for working parents to re-connect with their children. I spent about a year at home after each of my two children were born, but then went back to graduate school and later work. Bedsharing provides a wonderful way for parents and kids who are separated during the day to reconnect at night. 5. The family bed can eliminate a lot of bedtime battles. Our bedtimes with two young children aren’t always perfectly smooth, but our children have never expressed any fear of going to bed and we have never had the game of “just one” more story/drink of water/hug/etc. I believe they know that we will be there for them all night, so there is no need to prepare for a long separation. 6. Get a big bed. We started with a king size bed. I don’t sleep well when cramped for space, and with two kids who bedshare with us, we soon discovered this wasn’t enough. We added a toddler bed alongside it for our oldest. We soon discovered that wasn’t enough either. Now we have two beds pushed together for a king + full family megabed. Ahhhhhh. Space. 7. It can be done with multiple kids. Before our second was born, I wondered how we would continue to bedshare. Where would we fit? It turns out bedsharing with two kids works great. You just need a big enough bed. See #6. 8. It won’t last forever. My 4 year old is already talking about sleeping in her own room. She has even fallen asleep in her own bed a couple of times on a trial run, but returned to our bed each time in the middle of the night and happily climbed in under the covers. I realized it won’t be long before she no longer wants my presence at night. I have learned that these moments are fleeting, so I will cherish them for as long as they last.